Golf legend Amy Alcott talks with twenty-seven celebrated individuals about the one thing they have in common—the game they love. 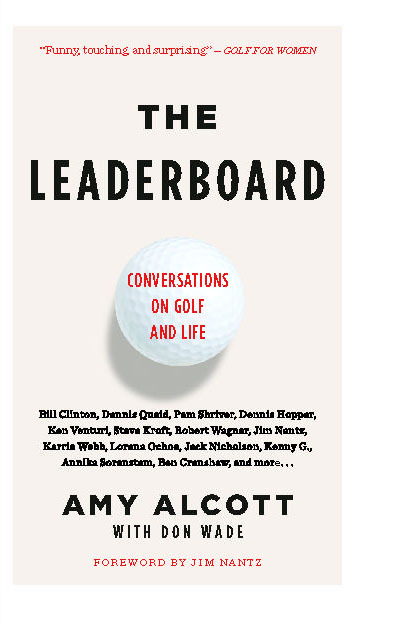 In this entertaining and fascinating collection of candid conversations, Amy Alcott offers a rare look at the personal lives and experiences—both on and off the golf course—of prominent entertainers, athletes, political leaders, and other influential figures. A fierce love of the game connects them all, but their varied anecdotes show how this magical sport has touched each of their lives in unique ways. Some highlights: Bill Clinton reveals why Hillary encouraged him to start playing again in his late twenties; Jack Nicholson explains how he began to play golf in his forties and became good enough to shoot a sixty-five; and Ben Crenshaw reminisces about his close relationship with Harvey Penick and about winning the 1995 Masters just days after serving as a pallbearer at Penick’s funeral. At times poignant, illuminating, and laugh-out-loud funny, The Leaderboard is sure to inspire and capture the imaginations of golf fans everywhere. Amy Alcott has won thirty-two professional tournaments worldwide, including the U.S. Women’s Open, and is a member of the World Golf and LPGA Halls of Fame. She has won the Kraft Nabisco Championship three times—an accomplishment she shares with only two other women—and five major championships. Alcott lives in Los Angeles. Visit her website at AmyAlcott.com.